Global Robotic Process Automation Market Size is estimated to be valued over USD 1063 million in 2019 – US$ 434 Million higher revenue than that in 2017. The industry will continue to register healthy growth throughout the forecast period. It will register 30% CAGR to create high revenue opportunity for industry players during the forecast period (2018-2028). The industry is expected to register strong sales in North America and Western Europe. Asia Pacific will show growth tendency during the same period, with china, Japan and India to create higher incremental opportunity. Software robots has gained wide scale recognitison and are performing large scale of operations that not only lower the operational cost but also raises the productivity scale. Emerging artificial technology has led companies especially large scale enterprises to adopt robot process automation (RPA) with machine learning technology to automate the whole operations and ensure higher efficiency. As a result, companies are becoming more agile and efficient and are expected to be fully digitalized in coming years. Global robotic process automation market is driven by factors such significant increase in ease of doing business through installation of robotic process automation. RPA market is not only useful in terms of overall economic value but also in workforce management, and improving quality control of company’s operations. IT reduces the overall time cycle and thus increases business performance by 2X to 8X. There is a high scope for automation and it is expected that nearly 51% of overall business operations can be automated. As such, there exists high potential for engaged players to drive their sales revenue worldwide. Though the overall RPA penetration in the business process is quite low, it witnessed over 51% growth rate between 2013 and 2017 – suggesting nearly 25% of business process spending. It will further rise to 35% by end of forecast period. There is immense opportunity for the growth of global robotic process automation market. Efficient learning, rapid innovations and effective testing in overall business ecosystem will drive the RPA adoption. Further, advent of artificial intelligence will hike the overall IT spending on initial stage. RPA will be the most benefited from such industry dynamics. Robotic process automation market size will be driven by usage across wide range of applications namely – BFSI, healthcare, retail, telecom, IT services, retail, insurance, e-commerce, manufacturing, chemicals and others. BFSI and IT will collectively account for over 52% of global demand in 2018. Adoption will be high in IT sector owing to higher IT spending, large scale business process with minimum turnaround time and faster technology adoption will act as key driving forces for IT sector. BPM is gaining higher traction and is expected to nearly 35% of spending towards RPA by 2026. As such, the RPA market share will grow on a higher note during the forecast period. Besides IT sector, banking and financial services too will register lucrative growth. RPA eases the wide range of activity in BFSI without the need for complex programming and thus helps in better client services. Moreover, the RPA is capable of minimizing the fraudulent activities – ensuring better safety and higher customer engagement – leading to higher profit margins. On an average, Banking and finance sectors spend nearly 18% on aligning IT with security for better processing networks. The spending is increasing with rise in business complexities – resulting in high operational cost and shrinking ROI. RPA is one such software and service platform that do not require complex programming. Once installed, it can scale up the business performance through automation and better turnaround with high security features. Insurance and ecommerce will be fastest growing segment collectively registering 900 basis points during the forecast period. Large scale entities will be the first to adopt the RPA. Insurance carriers use RPA in claims processing along with faster data processing. Large scale enterprise dominates the robotic process automation market size. Leading companies spends 250X higher amount on automation compared to small and mid-scale. Only a small fraction of the industry is capitalized with RPA. Higher adoption of RPA in BPM will create favorable business environment. Large scale companies is expected to reach a valuation of US$ 630 million in 2018. North America is the early adopter of RPA services and is expected to dominate the global robotic process automation market value throughout the forecast period. North America RPA market accounted for 58% of overall sales followed by Western Europe and Asia Pacific. Presence of large scale companies along with higher spending on R&D has created favorable business environment in the region. Asia Pacific will gain significant share post 2023 owing to RPA adoption in BPO and manufacturing sectors. China Japan and India will lead the regional share. Global robotic process automation market outlook is substantially consolidated. Blue Prism Group Plc, Automation Anywhere Inc., Jacada Inc., Be Informed B.V., and OpenSpan are key companies operating the industry. RPA adoption will increase in near future owing to its short time to investment recovery. It takes just 5 to 8 months to recover initial investment. As such, the market looks favorable during the forecast period. An in-depth analysis of the Robotic Process Automation market across regions – North America, Latin America, Western Europe, Central and Eastern Europe, Asia Pacific, Middle East, and Africa. How the Robotic Process Automation market sales is expected to grow throughout the forecast period. Purchasing of Robotic Process Automation market research report will give clients access to 120 minutes telephonic access with a research analyst. The duration for access to analysts will be based on the report subscription editions. RPA market is registering impressive growth since 2016. The industry has witnessed emergence of many new entrants funded largely by leading companies. The industry is going to revolutionize the way business is conducted. It automates the process to large extent – creating enough room for higher productivity. Bekryl has updated its RPA market intelligence report. The report offers key insights on how the industry will transform in another ten years. 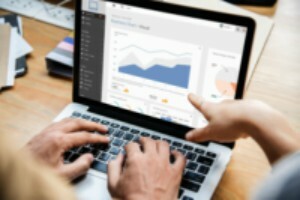 In order to prepare historical data and analyze Robotic Process Automation market forecast, Bekryl prepare data for product supply and actual demand from end-use consumers. Through this, we get to know actual demand for Robotic Process Automation market globally. The data collection is done through secondary and primary market research and then a constructive model is developed. With the model constructed, the cluttered data collected through different sources is structured with the help of proprietary analytical tools – making us understand the variation happened in the current year compared to historical years. 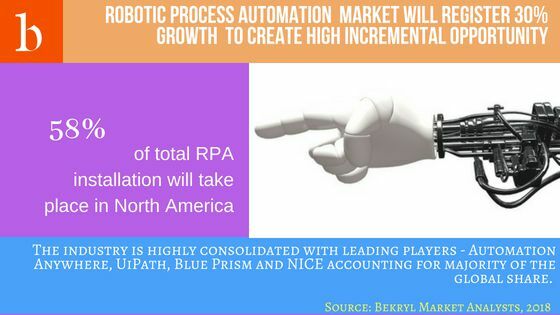 To forecast Robotic Process Automation market revenue, Bekryl Market Analysts takes in consideration the demand growth of the segments. Demand for the product is dependent on end-user spending which is a function of many factors: amongst them macroeconomic strength, price variation and other base factors. The forecast methodology requires extensive data analysis across countries. Among all the factors, GVA and GDP output is considered as the first set of approximation. Bekryl Market Analysts has developed a demand driven model based on GDP across targeted countries. Under this, co-relation is analyzed between product and GDP – resulting in a constant GDP-Product coefficient. Higher the coefficient- greater will be the growth rate. For instance, GDP-Product segment coefficient matrix of 3 denotes Robotic Process Automation industry growth is nearly 3.5X to 5.5X higher than the relative GDP.